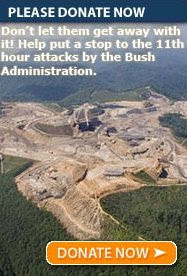 The Sierra Club are accepting donations to make sure that the Bush administration's last minute "midnight regulations" aren't implemented. "Just this week, the Bush Administration repealed a law in place since 1983 that prohibits coal mining activities within 100 feet of flowing streams. This change is a parting gift to the coal industry and will make it even easier for coal companies to continue Mountaintop Removal Mining, a practice that is already decimating Appalachia." Apart from adopting a Manatee from Florida and a Saguaro cactus from Arizona, Sierra Club is my favorite choice of charity. Their magazine, which all members receive, is a fantastic collection of environmental problems and solutions. Membership also boosts Sierra Club's political capabilities. They have been voraciously fighting against the horrible environmental policies planned and implemented in the last eight years. We are all very hopeful that Obama will change all that back to more protection for the environment and species on the verge of extinction.